Hee heheehe! I'm so excited! 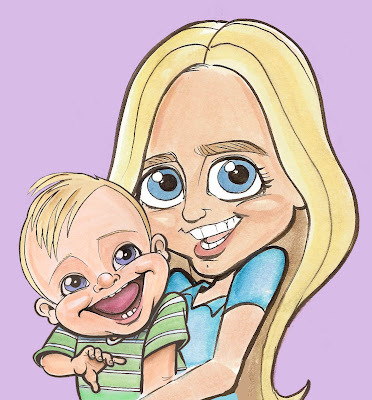 My husband surprised me with a caricature of Jett to match the one he did of me a couple years ago. As you can see above, I created a new blog banner with it. Isn't he just the cutest creature? 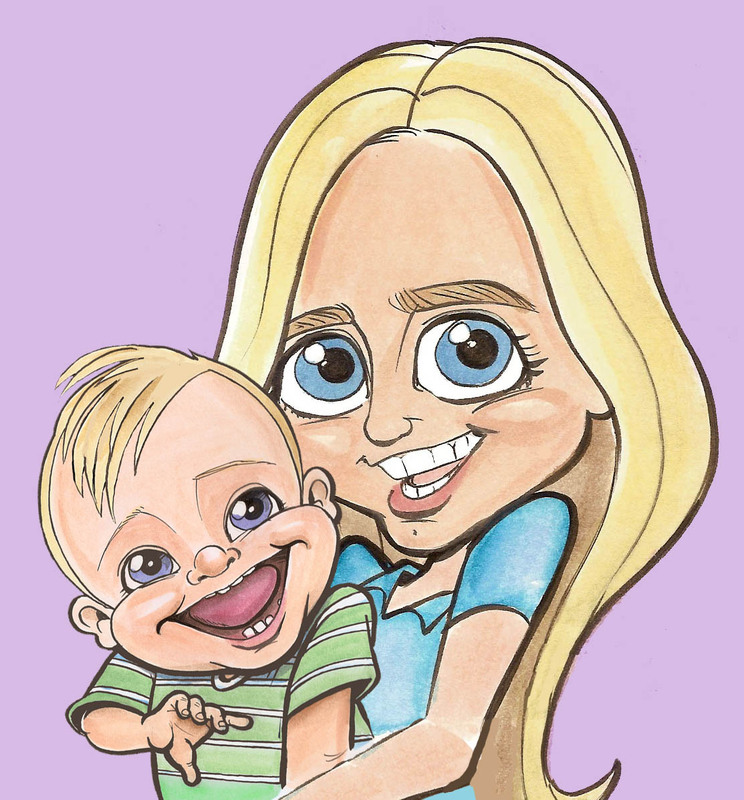 If you want a caricature of your own, in this style or in another one of Kenny Durkin's many amazing techniques, just let me know and I'll get a quote for you. You can check out Kenny's blog at durkinworks.blogspot.com. He posts everyday and has lots of Jett pictures in addition to showcasing his clever artwork. If your child's mouth is open, her tongue becomes desensitized and without the proper placement of the tongue, the inside of her mouth doesn't form correctly. Exposure to the air can also cause her tongue to enlarge. These issues carry over into sleep problems, with apnea and sleep obstruction and interfere with proper speech development. Here are tips to help you tackle this issue in many ways including supplementing; oral motor therapy; "mouth dot" training; loosening, clearing and preventing congestion; and breathing exercises. Our children with T21 usually have smaller nasal passages than a typical child. Coupled with their overproduction of GABA -- which causes airway epithelium to produce mucous and decrease the tone of smooth muscle -- and thyroid issues which can cause a swollen tongue-- we have quite a problem to deal with. So, it's very important to keep your child's nasal passages clear, not only for the benefits that breathing through the nose give, but also to avoid the problems associated with mouth breathing. Having a closed mouth prevents a domino effect on her development. How do you encourage a closed mouth? Jett has avoided a lot of problems because he was taking ginkgo to reduce the overexpression of GABA (see Ginkgo: The Hows and Whys for Down Syndrome). Now he takes EGCG (green tea extract) to balance GABA. I also was obsessed with keeping his mouth closed as much as possible. Here's a great blog post from Bill and Ria on how to keep your child's mouth closed and tongue in using oral motor therapy. There are 'spots' to stick on the roof of your baby's mouth, starting at 3 months old, for proper tongue placement. You stick it on 3 times a day for a few weeks. Afterwards the tongue 'looks' for it and stays in that spot. The tongue immediately lifts to "explore" it and the tongue learns to stay/rest there. He also said that it is an important spot in accupressure and closes meridians of happiness. He said that point allows the flow of serotonin and endorphins. The exact spot to put the spot is where your tongue would touch the roof of your mouth when saying "N". You can get them here: http://myomadeeasy.com/product/sticky-spot/ Other places to buy are here, but most moms like the first product the best. This one, you cut off a dot of the product: http://www.parthenoninc.com/products/Brava-Ostomy-Strip-Paste.html or from http://www.brucemedical.com/stpapoandwa.html in which you would use a hole puncher to cut them into small circles. Our children often have open mouths for many reasons, one is low muscle tone. Oral and deep muscle massage can help with low muscle tone, see Related Posts below. In the meantime, be vigilant about keeping your child's mouth closed. For Jett, right from the beginning, it was a non-stop job to close his mouth. When possible, I held him on my chest, tummy down as he slept. He was much less likely to have his mouth open in this position. Otherwise, I would put washcloths under his chin or the back of his head to make it so his mouth would be closed. When he was awake, I could usually just touch his tongue with my finger and he'd bring it in and close his mouth. Some parents put their finger under the chin and just close the mouth that way. A product I understand is successful in helping to prevent congestion and colds is Xlear. It's a saline nasal spray with xlylitol in it. One product I used successfully with Jett is Si Jin Bao brand of AIR tea. It's a Traditional Chinese Medicine concentrated herbal tea blend that cleared Jett's nasal passages. It takes a couple of months to fully clear the congestion and he took it twice a day from age 5-12 months old. It tastes great! My pediatrician recommended it. You take it before your child gets sick. I used to be up a lot in the night with the nose drops and "mucus suckers," but not at all anymore. I just clean out his nose quickly with a swab in the morning and give him saline nose drops twice a day. Before, Jett was completely congested back in his sinuses where I couldn't get to it. After using AIR tea, I could finally feel the air coming from his nose, which I couldn't do before. At 21 months old, Jett has never had a cold or sinus infection. I would give him 1/5 teaspoon (1 ml) in the morning and before bed with 2ml of water. He loved it! It's blended by hand in small, organic batches. And if you google baby vac, there are some YouTube videos of babies using it on themselves. Be sure to put saline solution in his nose every time before you use this. I understand that it works great for getting the stuff way in the back of the nose that would be difficult to get out with the Nose Frida. Neti Pot I have not used the neti pot for Jett since he is so young. But many people swear by its use. The Neti pot looks like a miniature tea pot. It's an ancient remedy that is filled with a saline solution and then used to irrigate the nose. It washes out all of the pollution, infection and allergens that may be causing trouble. It's okay to use the neti pot as long as symptoms occur -- from once a week to multiple times a day. If you don't have a neti pot, a pop-top bottle (like those used by cyclists) can do the job, as the top is bigger enough to cover a nostril, with a small hole in the middle. Here's a great post on natural ways to clear congestion at the 3 of 21 Blog. As mentioned earlier, our children usually have smaller nasal passages because the bridge of the nose is not as defined. The mid-face can get extra support with proper nutrition to support bone growth and nutrient absorption (see posts below) and with Craniosacral therapy. CST is an alternative medicine therapy used by osteopaths, massage therapists, naturopaths and chiropractors. CST is a gentle, hands-on method of evaluating and enhancing the functioning of a physiological body system called the craniosacral system, comprised of the membranes and cerebrospinal fluid that surround and protect the brain and spinal cord. The practitioner gently works with the spine and the skull and its cranial sutures, diaphragms, and fascia. In this way, the restrictions of nerve passages are eased, the movement of cerebrospinal fluid through the spinal cord is optimized and misaligned bones are said to be restored to their proper position. I've had craniosacral work done on myself well before Jett was born. Working as an artist, I could no longer feel my hands, which I obviously needed to continue to support myself. Out of desperation, I ended up with a practitioner who performed cold laser and craniosacral therapy on me. These two therapies allowed me to feel my hands again and to continue to work. Among many other benefits, CST also opened my nasal passages and ear canals. So, Jett has had several sessions of CST. (If we had more money, he'd get more!) Kristen Morrison, who wrote Naturally Better Kids, also has seen great improvement in her child through CST. She even has pictures showing how the bridge of his nose has become more defined after each session. If you are wary of trusting someone to manipulate your baby or child, have the practitioner do it on you first so you can have a better understanding for a more informed decision. Allergies, both through food and from the air, can be a main cause of congestion as well. You can help clear the air of many allergens by using a hepa air filter. Regular dusting and vacuuming, when the child is not in the room, helps as well. Replacing carpet with tile or wood flooring will also reduce the amount of allergens in your home. Honey, purchased from a local bee keeper, can help your body build up immunity against allergens outside your home. Honey should not be given to babies. I haven't had to try anything like this since Jett can keep his mouth closed himself now. If you have, or get, a neurodevelopmentalist, s/he can address the problem for you and create specific exercises to do. Otherwise, I found this article called "Using the Buteyko Breathing Method For Children" by Dr. Natalia Lapa, MD, Specialist in Remedial Gymnastics, Children Hospital No. 8, Novosibirsk, USSR, 1991. The paper was published in the book "Buteyko method. Its application in medical practice", ed. by K. P. Buteyko, 2-nd ed., 1991, Titul, Odessa, USSR [in Russian]. You can find the method explained here: http://www.normalbreathing.com/index-nasal-children.php. If you or someone you know has tried this, I'd love to hear how it worked for you. I have let Jett watch up to 30 minutes of television a day since he was about 15 months old, when I first read the article, "The Selective Use of TV and Videos for Advancing the Development of Special Needs, Typical and Accelerated Preschool Children", by Robert J. Doman Jr, found in this post: Some TV is Good for Our Kids! "...[D]evelopment of your central/macular vision is very important to many aspects of learning and overall development. Many of the problems exhibited by children diagnosed with developmental delays result from the lack of properly developed central vision....Early stimulation of the central/macular vision is crucial to the development of children within the first two years of life.....[W]e came to the realization that television provides a unique form of visual stimulation. The images on television can only be perceived using central/macular vision; one cannot process the information on the screen with peripheral vision....We were learning that not only is television a great tool for developing central vision in children, but it really is an outstanding educational tool." Before that, Jett watched TV incidentally. I was careful as to what show was on in his presence in order to prevent him from seeing actions or hearing words that I don't want him to repeat! The cooking channel was usually the easiest/quickest choice if he was in the room. Family Safe Media The TV Guardian filters profanity from your TV, DVD, Satellite, and Cable, while you watch. TVGuardianThe Foul Language Filter, mutes profanity while you're watching TV and movies according to your preferred filter level. It's read out loud and shows the (nice, big) words highlighted while it's being read. PLUS you can also choose closed caption and it appears with upper & lower case! (This is rare, so I find it rather exciting.) You have lots of well produced, cute stories to choose from. (Be sure to check out all the different categories on the left of the screen.) Jett loves this show, but our DVDR lost data so we lost all the episodes & it's no longer on our local PBS station. Stories are only like 5 minutes or less so it's also perfect for a quick distraction while giving supplements! If you can't stand children's shows, another program I'd recommend is the Singing Bee. It's a karaoke competition for adults where they sing mostly country songs and show the words on the screen as they sing. Jett loves this, but now that I've found BtL, I prefer he watches that. A good show to watch with kids is Animal Exploration with Jarod Miller or Growing Up... (an animal) on the Animal Planet TV station. They have great footage of animals and provide plenty of opportunity for discussion with your little one. I'd prefer a series that shows animals in their natural environment, but I haven't found one yet. Please comment if you know of one. Blues Clues- sweet show with a lot of interaction and a wide range of educational concepts. Jett's favorite episode is called Words where they find words and make a poem out of them in the end. Bear in the Big Blue House- gentle show with nice music and songs, learn such concepts as shapes, potty training, cleaning, senses, etc. Team Umizoomi- a cute cartoon that introduces early math concepts. The Cat in the Hat knows a Lot about That- Great show, lots of educational information. Daniel Tiger's Neighborhood- Love this! Teaches social etiquette with sweet stories and songs. Sid, the Science Kid- Awesome! Science for little children. Peg + Cat- Entertaining, creative show about solving math problems. Go, Diego, Go- learn Spanish, about animals and he even encourages kids to get up and dance or move with him. Jay Jay, the Jet Plane- a bit over Jett's head, but very educational and he enjoys it. It's a Big, Big World- learn about taking care of the environment and animals. Great show! Peep and the Big Wide World- cute cartoon with simple stories about three outdoor characters as they learn about and explore their world. Pee Wee's Playhouse- loved this when I used to babysit so I had to let him watch it. Turns out--it's great--gets him up and moving, teaches all kinds of stuff like manners, word of the day (too easy for him) and a variety of other educational topics. On the Fantasia 2000 DVD, there are shorts in the bonus materials section that are awesome: Toot, Whistle, Plunk and Boom and Adventures in Music. They are great to introduce many music concepts. I remember them from when I was little! Jett loves them! Donald's Mathmagic Land- this is a great DVD! So interesting. Jett is mesmorized. It'll take him a long time to get all the concepts introduced. Bo on the Go! Exercise cartoon. Hard for adults to watch too many times, but Jett enjoys it. Barney Dance Barney explores many different dance styles in a gentle, entertaining way. Rock N Learn's Dance with Animals can be for the very young. I think I saw the older version. It's not high quality in the least (terrible graphics, stupid songs), but gets Jett moving for sure! Get Fit America for Kids Learn Tia Chi and Yoga. This gets Jett huffing and puffing. Memoves.com has cool, relaxing movement clips. Jett does them on youtube. For kids who are reading or have a better understanding of the spoken word, (6-9 in the typical population), I recommend the Electric Company. Here's the parent support site: http://www.pbs.org/parents/electriccompany/. The Magic School Bus is another good one. Reading Rainbow can often be found in the library. As far as educational videos, I got most of the Baby Einstein video series from a garage sale. Jett enjoyed them, but it didn't seem educational enough for me so he only saw them once. There were few visible words (maybe 3 in a 30 minute video) and the verbal descriptions were too adult (actual adult poetry). They were visually stimulating, but playing and talking with your child seems much better to me than those videos. Maybe the newer DVDs are better? I got the Your Baby Can Read video series from the library. He loved these! If I had the extra money, I would get these videos because it does support the Doman method somewhat, although the word appears much longer on the screen than with flash cards so it targets a different part of the brain. The large word appears on the screen and shows a video image of the item in different scenarios. The choice of words are good and the children in the video are very enthusiastic and enunciate well. Really, if you had the time, you and your family could make your own video and it would be equally effective and even more delightful to your child. Just make your Doman flash cards and show the object or act out the word with enthusiasm in a couple of different ways. I would use this in addition to your flash cards. Here is Paul Doney's video of his son (with T21) using the YBCR program. He reads words and signs his response. Very cute! http://www.youtube.com/watch?v=c8hJaxrOsIQ . Readeez produces great DVDs that have songs and vignettes with large words that appear while spoken or sung. I highly recommend these. Jett loves them. He has been watching these for many months. The songs are great and our whole family loves listening to them and singing along. Here are some (over 100!!) free Readeez videos: http://vimeo.com/search/videos/search:readeez/st/6407bb8c Careful, there is a Beastie Boys video, "Shake Your Rump" that has some weird psychedelic graphics that FREAK Jett out! And Jett also HATES the video called "Dynamics" because it plays with volume and so is surprising. (Jett will even cry if my husband suddenly laughs too loudly.) So, if your little one has sound sensitivities, do yourself a favor and skip it. Otherwise, Readeez is AWESOME!! Brainy Baby's First Impressions is another DVD-based reading program that I understand is good. http://www.brainybaby.com/shop/html/Products/Value-Line-of-DVDs/Babys-First-Impress-91.html Since I'm teaching sight words I'd probably not show the alphabet one until later. And I'm not teaching him to count chronologically yet since I'm doing the Doman dot method, so I probably wouldn't show him the number one until later either. But the other titles look interesting. I know other parents have had success with the Signing Times series to encourage speech, reading and of course, signing. I haven't tried this because I'm trying to support Jett's verbal attempts at speech. I'm not against teaching some signs to your baby so he is less frustrated when trying to communicate with you, but at this point, Jett gets his message across and has made up his own signs. Rock N Learn Get Ready for Kindergarden I think I got the older version so the animation was terrible. Jett did enjoy it. It didn't really support the Doman method of learning, but it has a nice guide to tying your shoes and about making your bed and such. I got it for $2 at Good Will. What programs have you tried and how have they worked for you? I took a video of Jett last night "reading." As you can see, he is turning the book right side up, opening it the right way, he skips the introduction pages and goes to the title page and "reads" it by pointing (with his thumb) to the words and vocalizing. Then he turns the page glances at the left side and then reads the wrong page first then stops and reads the left side and then the right side. I had to stop the video because my husband laughed and Jett looked up and saw me and yelled for me to read it to him. These skills he exhibits are strong indicators of reading readiness and the fact that he's pointing to single something out reveals a more mature understanding of two-dimensions (that you can't take it off the page like a real object, but it is a representation of a real object). This video doesn't show it, but he points to a word and vocalizes and then the next word, so he recognizes 1) text as being different from a picture and 2) that a sound is associated with text. (I know he knows this, but it would be easy to argue that he's just copying my actions.) It's really hard to get a video of him because he loves your interaction and is interested in the camera, but I'm trying! In order to get this video, I had to hide around a corner and to put a book out that he's not allowed to read on his own (it's not a board book). To encourage the love of reading, and promote reading readiness, I followed neurodevelopmental principles as well as supplementation to improve his retention and cognition as outlined in the related posts below. Here's a video of Jett sight reading at 18 months as well as his attempts at writing/drawing: http://durkinworks.blogspot.com/2011/09/jett-and-magnadoodle.html And another of Jett reading 9 words in 1 minute 40 seconds at 19 months old. Jett reading 9 words in 1 minute 40 seconds. DS symptoms include a myriad of vision issues: strabismus, nygastimus, esotropia, refraction errors. Jett had nystagmus (really bad ocular flutter--like that guy in the movie The Crying Game). He was cured through TCM: accupressure, herbal teas etc. Western medicine says it's incurable. On Prozac, I didn't see a sudden difference in Jett except that his crossing eyes had slowly cleared up, which I did attribute to Prozac, but had forgotten just how bad his eyes were. I had taken it for granted. But, once I took Jett off Prozac for 2 weeks, I saw just how much Prozac was helping him. Off Prozac his eyes were crossing so much that he had to turn his head all over the place to try to see better. At times, his eyes were as bad as a googly-eyed doll! His left eye went inward a lot and the right eye... I'm not quite sure. Perhaps because of the vision issues, I couldn't leave him to play independently anymore because he would find a sock or some string to wave in front of his face and go, "Eeeeeeeeeeeeee," until I redirected him. This may be because he was trying to self stimulate his vision in order to try to correct. (See post Some TV is Good for Our Kids!) This stimming behavior would happen within five minutes of setting him on the floor to play. His vision is much too important for me to mess with.... Back on Prozac for only 3 days, he can play independently again because the stimming is gone and his eyes are much better--not completely gone, but hopefully will clear up again sooner than later. These eye issues can lead to amblyopia. Amblyopia is where the brain turns off the vision to one eye and depth perception is lost. Many individuals with DS have to do the "Step-step" on stairs rather than alternating feet on the steps. You need depth perception. Jett's been crawling on the stairs great since his eyes were fixed--we just took down his stairs to have our sofa back for company (his stairs were made out of sofa cushions), but I can't imagine him trying to walk them with poor vision! It is hard to learn, have coordination, alternate you feet on the steps, if you can not see. Can you imagine trying to read with the vision issues our kids have? The following study abstract detail the severity of the vision problems. GOAL: Improved vision to improve learning. Amblyopia and visual acuity in children with Down's syndrome. Tsiaras WG, Pueschel S, Keller C, Curran R, Giesswein S.
BACKGROUND/AIMS: Amblyopia in people with Down's syndrome has not been well investigated. This study was designed to determine the prevalence and associated conditions of amblyopia in a group of home reared children with Down's syndrome. METHODS: All children in the study group underwent an evaluation of visual acuity. In addition, previous ophthalmological records were reviewed, and a subgroup of children was examined. For the purposes of this study, amblyopia was defined quantitatively as a difference of two Snellen acuity lines between eyes or if unilateral central steady maintained (CSM) vision and a clear fixation preference was observed. A high refractive error was defined as a spherical equivalent more than 3 dioptres and astigmatism more than 1.75 dioptres. Anisometropia was defined as a difference of at least 1.5 dioptres of sphere and/or 1.0 dioptre of cylinder between eyes. 68 children with Down's syndrome between the ages of 5 and 19 years were enrolled in the final study group. CONCLUSION: This study suggests that the prevalence of amblyopia is higher than previously reported. Fully 46% of these children with Down's syndrome had evidence of substantial visual deficits. These patients may be at higher risk for visual impairment and should be carefully examined for ophthalmological problems. Visual acuity and accommodation in infants and young children with Down's syndrome. Accommodation and visual acuity were measured in 53 children with Down's syndrome aged between 12 weeks and 57 months. Results were compared with data for 136 control (typically developing) children aged between 4 weeks and 48 months. Whereas the control children accommodated accurately on near targets, accommodation was defective in 92% of the children with Down's syndrome, and there was no change in accommodative ability with age. On the other hand, visual acuity lay within normal limits for the younger children. Children over the age of 2 years showed a below-normal visual acuity, which is not explained either by refractive error or by the effect of poor accommodation. The data suggest a sudden change in the rate of development of visual acuity which may be associated with physiological changes in the visual cortex. Previously reported defects of accommodation and visual acuity in older children and adults with Down's syndrome are confirmed by our findings in infants and young children. Visual acuity in infants and children with Down syndrome. Is the selective serotonin reuptake inhibitor fluoxetine (Prozac) a fountain of youth? Evaluation of: Maya Vetencourt JF, Sale A, Viegi A et al. : The antidepressant fluoxetine restores plasticity in the adult visual cortex. Science 320, 385–288 (2008). The potential for synaptic strength to be regulated by experience is high early in postnatal life, and declines thereafter. The constraint of synaptic plasticity in the adult visual system is thought to underlie the resistance to therapy for the treatment of amblyopia. However, a recent report by Maya Vetencourt et al. demonstrates that systemic administration of the popular antidepressant fluoxetine reactivates synaptic plasticity in the visual system of adult rats, and enables the recovery of function in an eye chronically deprived of vision. Fluoxetine administration stimulated a decrease in basal levels of extracellular GABA, an increase in the level of BDNF and the return of long-term potentiation in slices of visual cortex. The ability to reactivate robust synaptic plasticity in the adult mammalian visual system has clear therapeutic potential for the treatment of amblyopia in adults. Laura Baroncelli1, Roberto De Pasquale1, Olivia F. O'Leary3, Eero Castrén3 and Lamberto Maffei1,22 Institute of Neuroscience, Consiglio Nazionale delle Recerche, Via Moruzzi 1, I-56100 Pisa, Italy. 3 Neuroscience Centre, University of Helsinki, 00014 Helsinki, Finland. We investigated whether fluoxetine, a widely prescribed medication for treatment of depression, restores neuronal plasticity in the adult visual system of the rat. We found that chronic administration of fluoxetine reinstates ocular dominance plasticity in adulthood and promotes the recovery of visual functions in adult amblyopic animals, as tested electrophysiologically and behaviorally. These effects were accompanied by reduced intracortical inhibition and increased expression of brain-derived neurotrophic factor in the visual cortex. Cortical administration of diazepam prevented the effects induced by fluoxetine, indicating that the reduction of intracortical inhibition promotes visual cortical plasticity in the adult. Our results suggest a potential clinical application for fluoxetine in amblyopia as well as new mechanisms for the therapeutic effects of antidepressants and for the pathophysiology of mood disorders.